I love the Winter Olympics. I spend far too much time inside watching them on TV than outside pursuing the sports that define us as the Great White North. I watch every event from the obliquely effeminate figure skating, to the utterly insane Skeleton, to the profoundly nonathletic curling. Let’s face it, curling is more of a game than a sport. It is the only event in the Olympics where you can a smoke and drink, and have a beer belly the size of PEI and still win a gold medal. Still, Canada has some amazingly talented “gamers” representing us on the rink. Go Canada. As a skier I have the obligatory contempt for the snowboarders. They are the evil cousins with which we share our ski slopes…the tattooed, pants too low, dope smoking underbelly of the ski world. Do you remember Canadian Ross Rebagliati who almost lost his Gold medal at the 1998 Olympics for testing positive for marijuana? “No seriously man, I never smoked the stuff, I was just hanging with my buddies who do.” “Oh, OK we believe you Ross, here’s your medal back”. They put marijuana on the list of banned substances after that. That’s why it is ironic that one of my greatest heroes of sport is a snowboarder. At the Torino games in 2006, American Hannah Teter won the Gold medal in the Halfpipe. This is the sport where they charge down a slope shaped like a ‘half pipe’ with 20’ high sides. They throw themselves another 10-15’ above the sides and spin their bodies in various tricks that have bizarre names like the McTwist and the Nixcy Grab. Only they know what they are talking about as they have invented a language all of their own. Most snowboarders are young self-indulged kids that are just out to have fun. That’s why Hannah Teter stands out. Since the Torino games she has donated ALL her cash prizes from competitions to charity. Over $75,000 so far. In partnership with World Vision she has adopted a village in Kenya. In the last 3 years she has provided clean water, farming supplies, school fees for the children and more to the village of Kirindon. 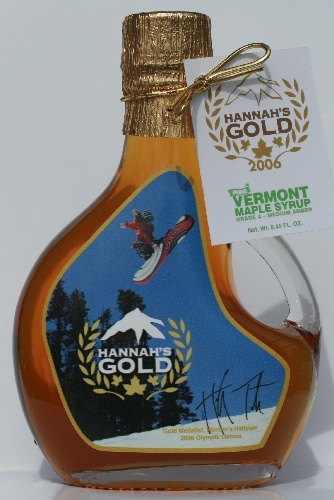 She has set up a non-profit business called Hannah’s Gold that sells maple syrup from her home state of Vermont. All the profits go to charity. $161,000 so far. Jesus never judged ambition, but instead redefined it. “Whoever desires to become great among you, let him be your servant. And whoever desires to be first among you, let him be your slave– just as the Son of Man did not come to be served, but to serve, and to give His life a ransom for many.” (Matt 20:26-28) As much as it pains me to praise a snowboarder, I have to admit Teter is my kind of athlete. I pray that her example is an inspiration to every one of us to start living for a cause greater than ourselves. Hannah’s silver is pure gold.